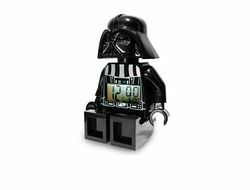 2856081 Darth Vader Minifigure Clock is a Star Wars minifigure set released in 2010. It is a clock. It is an almost exact replica of the Darth Vader minifigure but does not have a lightsaber or cape. Facts about "2856081 Darth Vader Minifigure Clock"